We’d love your help. Let us know what’s wrong with this preview of Your First 1000 Copies by Tim Grahl. Tim has worked with over 100 different authors from top best sellers such as Hugh Howey, Daniel Pink, Charles Duhigg, Chip and Dan Heath, Ramit Sethi and Pamela Slim to authors just get started on their first writing project. He has worked with authors across all fiction and non-fiction genres. Along with his client work, he has studied many other successful authors to lea Tim has worked with over 100 different authors from top best sellers such as Hugh Howey, Daniel Pink, Charles Duhigg, Chip and Dan Heath, Ramit Sethi and Pamela Slim to authors just get started on their first writing project. He has worked with authors across all fiction and non-fiction genres. Along with his client work, he has studied many other successful authors to learn what works and what doesn't. To ask other readers questions about Your First 1000 Copies, please sign up. Hello, everybody! I was looking for a book about book marketing and launching, do you think this is the best one? Thanks in advance! Peter Whittlesey I can't think of a better book. We're just launching our own book and the advice Tim gives is easy to understand and hopefully not too difficult to…moreI can't think of a better book. We're just launching our own book and the advice Tim gives is easy to understand and hopefully not too difficult to implement. For example, we would never have thought of getting about 25 people to read our books and write reviews they can post to Amazon on the day we launch our book. Just reaching out to 25 friends and colleagues was a step we would never have contemplated. That's just the tip of the iceberg. And just as valuable are his free, and I mean free with nothing to buy, lessons you can sign up for. If there is only one book you’ll read on book marketing, make it this one. It’ll take you less than two hours, and it’ll give you a clear roadmap on where to go and what to do and how, plus lots of resources along the way for you to accomplish it. A little gem of a book I wish I’d read earlier in my writing career. SO GET ON IT. I found this book to be straightforward, easy to read, and full of excellent marketing tips for authors. Although it is aimed at those who self-publish, it is applicable to any author, as publishers nowadays do very little to market the books they print. The best thing about it is that the marketing ideas are easily applied by new authors as well as those who have some experience marketing their books. So often, I find books like this are written for those who have very advanced technological sk I found this book to be straightforward, easy to read, and full of excellent marketing tips for authors. Although it is aimed at those who self-publish, it is applicable to any author, as publishers nowadays do very little to market the books they print. The best thing about it is that the marketing ideas are easily applied by new authors as well as those who have some experience marketing their books. So often, I find books like this are written for those who have very advanced technological skills, and those who aren't there yet can't apply the advice. Or the advice is really for non-fiction writers. This book, however, is equally useful to fiction writers and non-fiction writers. I highly recommend this book to any author from beginner to intermediate levels in their book marketing skills. Clear, concise, and open for interpretation between fiction and non-fiction writers. I would probably give this a 4.5 because I wish he focused more on fiction authors in some sections, which leads me to figure out ways to adapt certain tactics. Can't wait to implement some of his ideas. At a general level this is a book well worth reading, simple to digest with pragmatic advice - But its missing something important for new authors & those new to assembling their social media platform presence (SMP) de novo (esp. www-site/blogging around your area of expertise). This book is predicated on Tims Connection System: Permission, Content, Outreach, and Sell. Within each chapter he provides good common sense / practical guidance on how to implement this system. HOWEVER - look at th At a general level this is a book well worth reading, simple to digest with pragmatic advice - But it´s missing something important for new authors & those new to assembling their social media platform presence (SMP) de novo (esp. www-site/blogging around your area of expertise). This book is predicated on Tim´s Connection System: Permission, Content, Outreach, and Sell. Within each chapter he provides good common sense / practical guidance on how to implement this system. HOWEVER - look at the title "Your first 1000 copies" and his first system component "Permission" i.e. getting email addresses from your readers &/or via your SMP. Permission assumes the person bought the book and/or has accessed you via your social media platform (esp. www-site/blog) and you have been effective in getting their email, whereupon the 3 other parts of the system can be implemented. Its a little bit of chicken & egg here because you need readers who have bought your book and then subscribed to your list, or you already have a SMP presence and have been establishing email permissions beforehand (or still need to). In my view this book could have gone further in detail in focusing on how to actually promote & market (1-2-1 or 1-2-many tactics & channels; this is not an easy thing to figure out...). This latter point is a huge learning curve in itself, and i did not really find this book helpful in this regard. In my view the connection system is a little more medium term in impact (1 year plus), and longer term if you need to build your online/niche expertise. Bottom line, in my view, is its only half the answer. As I recently self-published a book of my own, I take great interest in any source of new information regarding improving my writing and bolstering my book sales, so this book certainly felt like something worthwhile. It also came recommended to me by several people with varying degrees of familiarity with the work. In review of the synopsis and looking over the author's credentials, I has to agree that this seemed like a good read. It had good reviews too so I figured this would be well worth a As I recently self-published a book of my own, I take great interest in any source of new information regarding improving my writing and bolstering my book sales, so this book certainly felt like something worthwhile. It also came recommended to me by several people with varying degrees of familiarity with the work. In review of the synopsis and looking over the author's credentials, I has to agree that this seemed like a good read. It had good reviews too so I figured this would be well worth a purchase. I'm all about improving myself personally and professionally, but find that self-help and advice books fall flat all too often so I have become a bit skeptical of them. Upon seeing all the positive reviews and reading the lengthy synopsis, I was excited that I finally found something that might actually help me in the way that I need. What I got, was just not anything that met my hopes for the book in any way. Disappointing and dishonest are the main words that come to mind here. The advice within this work manages to be inconceivably vague despite coming from a supremely narrow experiences. In terms of what I actually think of it, it's actually a 1 for me and only gets a 2 because of some general tips that should be common sense, but many indie authors have proven otherwise. I also got a new idea or two for my own platform which might sound positive but those ideas come more from the spirit of what was said rather than what was actually being said. I found most of the advice in this book to either be vague or nonsensical. Sure, there are good points about how authors shouldn't spam their twitter followers with countless posts about the same thing or go around demanding attention for their work as if the world owes them something. When it comes to this sort of thing, the advice of what not to do is totally valid. The problem is that those who are reading this book probably care enough about being successful and establishing a positive reputation that they aren't the ones guilty of those types of offenses. It's effectively a "preaching to the choir" type of scenario on this end - at least so far as I see it. Next up are the bits of "advice" that are really just sweeping and unhelpful. There's a chapter on providing marketing content that effectively states that authors should provide worthwhile marketing content. The book never really bothers to provide examples about what might constitute good, worthwhile content for a fiction author. It provides one or two examples from authors that the writer of this book has worked with, but all of his clients seem to come from self-help and professional development sort of backgrounds so the type of marketing content they provide is NOT going to be what a fan of fiction cares about. If you happen to have an interest in non-fiction writing that is intended to improve people's lives, then please note that YOU may very well like this book. The problem for me is that this is in no way indicative of the type of books I want to write and I feel like this should have been a book marketed as something that only really applies to those who want to successfully write within this niche field. If you're like me and prefer fiction writing then the rest of this review will probably be of interest to you. As a precursor to the next main section of this review, I want to say how a lot of advice seemed utterly ludicrous to me. The author seems to have strong feelings against social media and prefers things like email lists and pop up ads. I'm sorry but email lists and popup ads?! I have never clicked on a popup advertisement, in fact, if it looks sketchy enough, I literally close that web page and never come back. And as far as email lists go, they do make sense for the type of marketing content that HIS PARTICULAR clients would be providing, but I do not want a fiction author in my inbox, even one I really like. Unless it is a direct interaction that an author is having with me like asking for a review swap or exchanging publishing advice, I really just don't have an interest in emails from authors. At the very most, what I will do is email subscribe to their blog feed. Blogs, in fact are my preferred way of getting updates from the authors I care about and social media - twitter in particular is something I've been getting more engaged in (now that I've un-followed the really spammy writers who were dominating my feed with shamelessly repetitive advertisements and self-promotion). Fortunately this book does bring up blogs as a good way to connect with readers and other writers, but again, the details of how to do this correctly are so hopelessly obscure. I mentioned above that I had a lot of beef with this author's stance on what tools are good and why. He practically trashes social media in one chapter only to backpedal a bit later on and say how it can be good as a supplement. He is correct in saying that the number of likes to a page does not reflect sales, but you can absolutely use social media as a good way to spread the word about things, its just difficult - like every other form of marketing. He also cited some ridiculous "fact" about how people read only 1% of their news-feeds on social media sites and that the percentage of emails read is much higher. I don't know if it's just an age demographic thing, but I DO NOT read even close to half of the emails that come in, but I WILL read just about everything that shows up on my main feeds. I won't continuously scroll so that more content loads so maybe that's where the 1% comes from since the concept of the feed isn't really defined. It just felt like a really wishy washy fact and a lot of the alleged statistics here definitely felt the same. It might seem arrogant to call out someone who has built up successful marketing platforms, but fishy facts are fishy facts and I just had a really bad gut feeling about nearly everything this author tried to convince me of. The opinions felt incredible dated and inaccurate despite this being published in 2013. There are tools like Goodreads that I don't recall him touching upon at all and he never really gets into the most important part of book sales: REVIEWS!!! Maybe he mentioned these things in one fleeting statement or two, but it certainly wasn't substantial enough for me to recall even if it was there. There's one part where the author gives the example of the shady car salesman and how he is someone who only really cares about selling you the car that is right for him and not necessarily for you. It's easy to shut down and walk off the lot upset because any functional person is going to know when someone is trying to manipulate them into something they don't want to do. The feeling is even worse when we realize that someone has actually succeeded in said manipulation. This is absolutely the the case with authors since there a lot of ways that a writer can oversell or falsely advertise their book. My problem with this point is that I felt like the author is guilty of being the selfish salesman. He's very patronizing in his tone and I think he just tries too hard to make himself sound more knowledgeable than he really is. That sounds insanely harsh, but the bottom line is he keeps bringing up HIS clients and their experiences, none of which felt applicable to ME. This book felt like a car that a salesman tricked me into buying - a purchase that I now somewhat regret. Maybe I still needed that car like I need this information, but at the end of the day, what I ended up with isn't something that fit those needs and now I need to look elsewhere. I feel this is something that needed to have a more specific focus because the way that it tries to be all encompassing, is not only disappointing, but also just plain dishonest. This little book is packed with information that I can't wait to apply to my next book release. My last book release had me dreading promotion, but Tim Grahl's handbook has given me the tools and the perspective to dive into the next book launch with gusto. I can't believe how helpful this book is! Thanks, Tim! This book is easy to read and easy to comprehend. For a tech-challenged fantasy lover like myself, some of the suggestions are less easy to implement (Start a blog? Create a legal mailing list? ), but I did it, and if I can do it, believe me, so can you. And if you really can't, get a teen to help you. I still don't 'have it all together', but I'm doing better as an author and I'm having more fun than I used to. Mr. Grahl's teaching on building a platform and marketing is SO important, and puttin This book is easy to read and easy to comprehend. For a tech-challenged fantasy lover like myself, some of the suggestions are less easy to implement (Start a blog? Create a legal mailing list? ), but I did it, and if I can do it, believe me, so can you. And if you really can't, get a teen to help you. I still don't 'have it all together', but I'm doing better as an author and I'm having more fun than I used to. Mr. Grahl's teaching on building a platform and marketing is SO important, and putting it into practice has opened all kinds of doors for me. I write fantasy, totally fiction, but I've still been able to build a viable platform and follow the 'relentlessly helpful' method. Will I be the next Suzanne Collins? Probably not, because I have a kind of small niche, but I'm already seeing that I have a much bigger audience than I originally thought I would. I should probably mention that Your First 1000 Copies and the posts on Mr. Grahl's blog are intended for people who are selling or intend to sell a worthy product. It's not a get-rich-trick-people-into-buying-your-book way of doing things. It's hard work, but it's rewarding and I've enjoyed most of it while doing it. I've decided not to go into any detail on specifics within the book. You can read the table of contents for an idea, and better yet, you can subscribe to Mr. Grahl's blog for all kinds of free information. I admit that I followed him for a while, slowly putting his ideas into practice, before I bought the book. I wanted to see if there was anything to it before I invested any actual money in it. I have not been disappointed. I also want to say that you don't have to be a writer to get something out of this book. The principles are foundational to any kind of internet sales, and really, to sales in general. A fantastic book that I'll continue to return to for as long as I'm in this business. A really valuable book. This man knows more than all these 'gurus' who sell courses. Good, solid advice from a man who walks the walk and who has helped countless people. I've recommended it to other people. Lots of food for thought, with some actionable ideas. Somewhat vague in areas, but good for anyone whose looking for ideas to market his or her book. 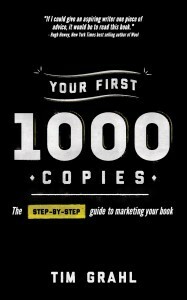 200 pages to say "start a newsletter and ask people to buy your book"
Super helpful look at the self-publishing world. More practical advice than Seth Godin (under whom Grahl studied) but equally inspiring. Must read for self-published authors. Great info! Not even done with my outline yet BUT let's have a glance in case it has some kernel or pearl portion of wisdom that I should be embracing well-before it's all said and done. I’ve been a professional book marketer for a dozen years, but I’m never not looking to learn from others in the game. Tim and his book have been on my radar for years; I’ve attended his webinars, watched his videos, and learned from his content. When I stumbled upon his book that’s been in my pile for almost five years, I had to read it if just to find a different way of working with authors to make them better, even just a new case study or metaphor. Of course this book has them (even some case I’ve been a professional book marketer for a dozen years, but I’m never not looking to learn from others in the game. Tim and his book have been on my radar for years; I’ve attended his webinars, watched his videos, and learned from his content. Of course this book has them (even some case studies from books I’ve worked on!). And it can either help you get started if you don’t know how to start or feel confident that you’re already well on your way. But it’s very basic 101 marketing stuff, more focused on mindset (“If you want to sell your books, you have to ask people to buy. And you have to be enthusiastic when you ask. You have to believe that you’re being relentlessly helpful in every area of your platform, and that the offer to buy is a fair and honest part of that system.”) and what he calls The Connection System (seek permission; share content; engage in outreach; then sell) with emphasis on building your email list, developing relevant useful inbound content, retaining and converting that audience into sales, repeat. I know Tim Grahl does great work, but this was even more useful than I expected. His 'connection' system is based on sound marketing principles, is well explained, well set out, and given good examples. That's what I expected from him. The 'bonus' material is online and integrated seamlessly. Tim is as he suggests we be: relentlessly helpful. What I didn't expect and also really value are the "this is how the big kids play" insights that pepper the book. Sometimes the mindset is what helps to com I know Tim Grahl does great work, but this was even more useful than I expected. His 'connection' system is based on sound marketing principles, is well explained, well set out, and given good examples. That's what I expected from him. The 'bonus' material is online and integrated seamlessly. Tim is as he suggests we be: relentlessly helpful. What I didn't expect and also really value are the "this is how the big kids play" insights that pepper the book. Sometimes the mindset is what helps to completely reframe activities and issues. Plus, he's a friendly, intelligent guy and his voice makes for nice company when you're sitting alone in your study wondering why the hell you try putting all these words together. I made a lot of notes and I know I'll be referring to this book in the future. 3.5 stars. Useful information that is good to know, if a bit repetitive. This book is brilliant. 100% practical, 0% fluff. Every writer who wants to get better at marketing should read this. I learned so much from it. I expect I'll reread sections, or even the whole thing, quite a lot in the future. I've already implemented several of Tim's ideas and I'm looking forward to getting more of my connection system built. I love the links with up to date info. Thank you for being so helpful and genuine. A strong 3.5 but I'm feeling generous. Furthermore the book is currently priced at $0.99 or £0.99 on Kindle which is a very fitting price tag. Let me explain how I came across this book as it goes a long way to highlight Grahl's key messages and takeaways. I'm a long time listener to the Self Publishing Podcast, on which the author Tim Grahl was a guest a few months ago. He shared worthy comments about Internet Marketing, a term that makes me feel both icky and inadequate as an independent publish A strong 3.5 but I'm feeling generous. Furthermore the book is currently priced at $0.99 or £0.99 on Kindle which is a very fitting price tag. I'm a long time listener to the Self Publishing Podcast, on which the author Tim Grahl was a guest a few months ago. He shared worthy comments about Internet Marketing, a term that makes me feel both icky and inadequate as an independent publisher. So I clicked through to his website. Then I signed up for his free 30-day course. I probably read 50% of the emails he sent (which you'll learn from Your First 1000 Copies is significantly higher than average) and I downloaded a few of the free resources available online too. Following the end of the 30-day course I continued to receive Grahl's newsletter and I continued to dip in and out of them, in other words, they weren't immediately deleted. After reading 3 or 4 of his emails documenting his book sales - he has set himself the goal of selling 10,000 copies in one year - I received the email that shared a more personal story. He was openly acknowledging to us that he may not meet his target of selling 10,000 copies of this book in one year. And he asked his readers for help. I only then bought and read this book when a friend of mine on Facebook shared it as a worthwhile read and also notified me that it was 99p. That's when I downloaded it and read it in a quick single sitting. This is the lengthy process of book buying. Here I am an independent author who wants to sell more books and I was not convinced this book could help me until many declarations and reinforcements later. I MUST REMEMBER THIS: SELLING ONLINE IS NEITHER QUICK NOR EASY AND IT IS MULTI-FACETED. But it doesn't have to be cheesy or sleazy. It is a slow but methodical process of asking permission, being of value to those who give you permission, and being creative when it comes to the content I make and share, the platforms I use to share it on and the ways in which I think about outreach. Oh, and it's okay to ask people to buy things. Your First 1000 Copies does give you many ideas and strategies on how to do this. I now have a list of actionable items and changes to make about how I approach Internet Marketing. In other words, it no longer makes me feel quite as icky. And maybe one day I'll also feel a little less inadequate. Any truly useful guide to navigating the new media landscape is necessarily going to provide a flexible, "basic" framework, and leave the specifics to be covered elsewhere. So while there are other great guides for authors who publish (and self-publish)—Booklife is probably the most thorough one I've come across, and Christina Katz's Get Known Before the Book Deal was written especially with "writer mamas" in mind—Tim Grahl's is my current go-to book both for writers looking to understand the co Any truly useful guide to navigating the new media landscape is necessarily going to provide a flexible, "basic" framework, and leave the specifics to be covered elsewhere. So while there are other great guides for authors who publish (and self-publish)—Booklife is probably the most thorough one I've come across, and Christina Katz's Get Known Before the Book Deal was written especially with "writer mamas" in mind—Tim Grahl's is my current go-to book both for writers looking to understand the concept of platform, and to start building their own. This lean, easy-to-read guide covers all the bases of modern digital life in an easy-to-grasp sweep. He wisely forgoes cramming in specifics, opting instead to link out to pages on his site with updated recommendations. Best of all, for now, anyway, everything Grahl recommends is fully road-tested. His business for the past several years has been building platforms for published authors, both NYT-bestselling and those who want to be. I bought this book after reading a 5 star review. In particular it was a comment around this book tells you what works and what doesn't. Hmmm I didn't find the answer except the author is pro email marketing and questions the effectiveness of social media marketing. But I don't think he gave enough clarification to support his argument. One thing I did find amazing was the authors choice examples to promote his point of view. I was interested in discovering CJ West's email campaign until I checked out his book rankings. Hmmm obviously his email campaigns are not helping his book sales. Overall I found this book hard to read. I wasn't engaged early and as I moved further into the book I began to firstly skip paragraphs which quickly became pages. I didn't finish the book. I was looking for an action plan. I didn't find it. In fairness I didn't finish the book and perhaps I missed some hidden gems. In preparation for my debut novel being released next week, I have been doing a lot of research on how to best market my book. The trick is always to find books that will actually add value, and is not just an arbitrary person's attempt to make a quick buck, by throwing some random thoughts together and presenting it in a fancy cover. This book adds value, and has solid advice that can be implemented immediately. I have implemented most of the principles described, and can definitely already see the results. This is useful material, and the author's list of clients shows he must know his stuff. But as a book it is not a home run. If one has not done any exploration of platform building through blogging, it is probably a good first summary of what to do and why. I personally found the free ebooks given away on Copyblogger more informative--and certainly better edited. There are many places he refers readers to a website for a specific page of current content. The couple I checked redirected to his co This is useful material, and the author's list of clients shows he must know his stuff. But as a book it is not a home run. If one has not done any exploration of platform building through blogging, it is probably a good first summary of what to do and why. I personally found the free ebooks given away on Copyblogger more informative--and certainly better edited. Really good, really quick little guide to book marketing. I think this would be good whether you're a self-publisher or following a more traditional route. The reality is, all writers need to be marketers these days, and this book gives you easy steps you can follow to sell more books without feeling like a sleazy spammer. Pair it with David Gaughran's Let's Get Visible: How To Get Noticed And Sell More Books and you'd have a pretty solid system to start marketing your books. This book has been an eye opener for me. I'm an aspiring author and reading this book allowed to better understand what works and why. I was about to fall into the same pitfalls as many authors. This system is comprehensive, easy enough to apply and Tim Grahl explained the reasoning behind each step, which makes this system, a well educated and applicable process. I would recommend this book to any authors because information provided is applicable to all writers. The best book on marketing for authors—hands down. I had a marketing plan in progress before I even got halfway through, and by the time I finished, I had a thorough understanding of how to sell my books and continue to grow my platform. Tim Grahl is a genius. I can't wait to put all of these instructions into practice! I already have a six-month content schedule for both my blog and email list. I can't recommend this book enough! Great book, focusing on marketing from a human connection perspective. Not a lot of talk about technology or sales copy, just real relationship development. I found the section and re-packaging content in new formats especially helpful. Definitely worth a read if you are in the world of book promotion. Plain and simple...if you're a self-published author, it's a must read. PLEASE pay close attention to where he says to go on his website to view the latest developments that he recommends. He hasn't given me one bad recommendation yet, that I could find. Straightforward and simple to bring to bear all recommendations. Try it with this one "How I Sold 80,000 Books" by Alinka Rutkowska. You'll be topping the best seller list in no time.